A superbly assembled nineteen track compilation of The Attack's unreleased cuts, radio sessions and Decca singles. If you're a fan of late ' 60's UK psychedelia, 'About Time' is simply one of the best releases I've seen in sometime now. Best tunes here are "Any More Than I Do", "Feel Like Flying", "Try It" (also like the Standell's version, I saw the Grassroots play the oldies circuit in the ' 80's performing this song ), the awesome "Go Your Way", the total grooving "Colour Of My Mind", "Lady Orange Peel" (fantastic guitar licks), their well played Stones cover "Sympathy For The Devil", the uptempo "Neville Thumbcatch" and the band's hefty rocker "Strange House". Also was impressed with the more familiar "Mr. Pinnodmy's Dilemma" - a tale of a boy who cannot hear or speak, "Hi Ho Silver Lining", "Anything" and a couple of their live on-air radio sessions, the somewhat corny "Created By Clive" and "Come On Up". 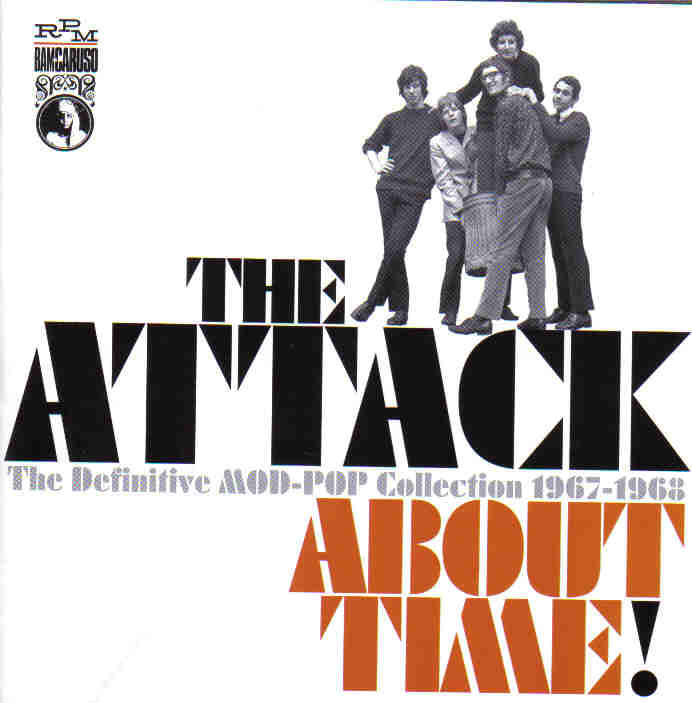 The Attack experienced several line-up changes through out their brief existence, 1967-68 but their most vital personnel appears to have been the following: Richard Shirman - vocals, Geoff Richardson - guitar, George Watt - organ, Kenny Harold - bass and Chris Allen - drums. Previously, I had thought that John DuCann (Atomic Rooster, Andromeda) was the main stay of The Attack but it's a fact that DuCann merely sat in just a few of their studio sessions. It's noted in this CD's 14-page booklet that around the time these songs were recorded, The Attack was among four much-appreciated UK psych bands. The other three were The Who, The Creation and The Action. I envy anyone that got to attend any live gigs by any or all of these four groups. More than likely to appeal to fans of Tomorrow, Q 65, The La De Da's, early Who, Five Day Week Straw People and possibly The Deviants. Simply, a M-U-S-T have. Long live psychedelia!